Ait Ben haddou is a world from the past. Located south of Marrakech, across the Atlas Mountains. So, you’ve seen it on TV in Game of Thrones and BBC Atlantis. But Why should i visit Ait Ben Haddou in Morocco? Along the edge of the Atlas mountain ranges, lost and completely out of the time, lies the city of Ait Ben haddou. Deprived of occupants, the older part of the city now comprises of not more than 15 families! But thanks to the town’s dazzling and exclusive medieval looks, the place is visited by tourists and prominent figures of the film industry on account of its architectural and cultural values. The city is fortified and has many structural monuments and buildings of great value. So invaluable is the place and its earthen architectural designs, the city is on the prestigious list of ’UNESCO World Heritage’. Apart from the film makers and directors who come to visit the town, art lovers and people interested in restoration projects usually find their way in to the city of Ait Ben Haddou. The wonder of the Ait Ben Haddou is its exquisite architecture of mid-17th century. The positioning of the clay bricks at oblique angles for building the walls were the earliest examples of its kind. The town was known to be attacked by many invaders in hostile attempts of taking over the place. Apparently, these invading troops seemed to steal just the grains and wealth only to leave the petty inhabitants starving to death. The Granary and the fortified towers overlooking the town from the high raised walls were held by guards who kept the city safe from these invaders of the north. The smart layout of the city such that the mosque is placed at the centre, surrounded by other buildings is remarkable. What was once recognized as a thriving city of the north now stands as a ghost town. Getting to Ait Ben haddou from Marrakech and Ouarzazate is not that hard. A private bus or a minivan can from Marrakech brings you to the city in a few hours. If you prefer public transport, then boarding a bus from Ouarzazate would be good idea, as it would take not more than 30 minutes to get here. But the buses that leave from Ouarzazate do not actually pass through Ait Ben haddou directly, but drop you at the intersection road of Ait ben haddou to the Marrakech-Ouarzazate highway road. Now, the town lies at a distance of 7km down the road. Many locals would be glad to give you a ride for some extra money. The timings and availability of these rides are not certain, added to which you may not even like the rates that they ask for. But, there are day excursions that take care of the trip to-and-forth, from Ouarzazate and Marrakech. 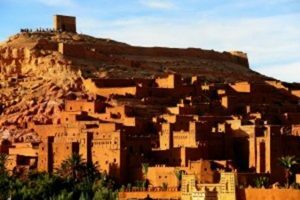 Joining excursions to Ait Benhaddou is highly recommended as you are given the benefits to make as many stops as you wish for during the trip. The journey to the old city is very thrilling and mind boggling as it takes you through the narrow and criss-cross passage that goes over the Atlas Mountains. Perfectly situated on the hill overlooking the fertile river valley along with the snow-capped mountains of the Atlas in the background, the scenic beauty of the place is purely magical. The pass called the Col du Tichka, is at an altitude of 2260 m and the view from up here seems to encompass the whole world. Ait Ben Haddou – the Television star of Morocco! The medieval looks of the place has attracted a lot of directors and writers of various film industries to shoot movies and television series such as ‘Lawrence of Arabia’, ‘The Mummy’, ‘Gladiator’, ‘Game of Thrones’ etc. Not only that, the city also attracts many tourists who have a love of architecture and the Kasbah lifestyle. Many buildings inside the old city compound walls have been turned into art shops which now sell antiques, souvenirs and other handicrafts. The old city of Ait Ben haddou is actually accessible only by foot or on a donkey’s back. The city itself is separated into the modern city and the old one by a shallow stream of water of the Maleh River. All means of transport leaves you off at the modern city. With the help of the fellow inhabitants awaiting you at the river shore, you can cross the river on a donkey or horse back. The transport would cost you a few dirham. After crossing the river, you are addressed by the high raised walls of the old city. There are basically four entrances to the city. Although there is no such system as an entry fee, locals willing to offer their guide services may try to persuade the fellow tourists to pay a nominal, yet completely unnecessary, fee to apparently enter the Ksar! Also, there are no such compulsions that tourists must have a guide along with them. After that, there is only the steep wall that separates you from the castle. The strategic positioning of the building that rests against the mountain comprising the foundation of the city is simply brilliant considering the time and resource that they had in those days. The buildings of old Ait Ben haddou were made of moulded earth and clay bricks. After you enter the complex, it will surprise you that the interior is actually more spacious and wide contrary to what it may seem from the outside. A Series of stairs and streets will lead you to the view point on the top of the fortress. Once used by the brave soldiers to safeguard the forts, the Granary at the top the hill is particularly a site not to be missed. Enjoying the hustle free environment and the privilege to climb on towers and enter any room sets a vibe of enthusiasm in your mind and makes you wonder of how the lifestyle of the people back then would have been. Once the exploration of the old city of Ait Ben Haddou is over, it is time to cross the river and head back to the modern part of the town. There are many fine restaurants and shops made of the same mud bricks, portraying the long-lost earthen architecture of that period. The town is filled with very friendly and helpful people. Drinking the mint tea and enjoying the traditional dishes of this place really boosts up the energy. And not only that, this part of the city is filled with shops selling wooden artefacts and several other souvenirs. There are various other shops selling hand-made carpets at considerably high prices. Though there is not much to be done during the night time, the town has some good resorts and hotels providing a beautiful view of the fortified city resting on the hills. The tomb of the founder of the city, Ben-haddou is situated at the base of the hill on the opposite side of the town. Ait ben-haddou, a place that has preserved its ancestor’s achievements and culture for so many years is worth giving a shot.